Meet the Newest Denver Zoo Baby, Tonks! Courtesy of the Denver Zoo. Yes, this is a real animal. No, it's not a bat (she's a primate!). Yes, it IS cute in a "what am I looking at?" sort of way. Welcome to Denver, Tonks! This little babe was born in Denver on August 8 to parents Bellatrix and Smeagol. 'What is she?' you might ask. Tonks and her parents are aye-ayes, elusive nocturnal lemurs that are native only to remote parts of Madagascar. Aye-ayes are classified as endangered, with unknown numbers in the wild, and only 24 residing in seven zoos in the U.S. And lucky for us, we’ve got a new one right in our own backyard! These little primates are really rare and hard to see out in the wild, but up close, they are anything but. While they only grow to about five lbs, aye-ayes have coarse dark hair, long bushy tails, rodent-like teeth that always grow, piercing eyes and skeletal hands that feature extra-long middle fingers with hooked claws. No wonder dear old dad is named Smeagol. According to the zoo, Tonks’ first few days were a little rough as Bellatrix had a hard time adjusting to motherhood. While this little lemur is now back in the aye-aye exhibit with her parents, it’ll be more time yet (like a few months) before she’s out and ready to meet her adoring fans. What do you think about Tonks? 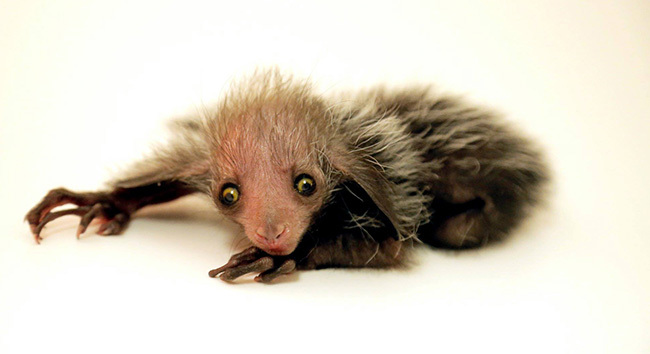 Have you seen the aye-aye exhibit at the zoo? Let us know in the comments below. The Denver Zoo welcomed two more babies to the ever-growing family!